Just posting some ideas to expand upon the in game classes. In bold are my suggested changes, non bold are my thoughts behind them. Change Bless to be usable by Cleric and Paladin. "A Paladin is a warrior bold and pure, the exemplar of everything good and true. Like the Fighter, the Paladin is a person of action and combat. However, the Paladins live for the ideals of righteousness, justice, honesty, piety, and chivalry and strive to be a living example of these virtues so that others may learn from them as well as gain by their actions." "The Cleric is a generic priest who tends to the spiritual needs of a community. Though Clerics are both protectors and healers, they are not purely defensive - when evil threatens, the Clerics are well suited to seek it out an its own ground and destroy it. The opposite is true of evil Clerics as well." Both of these classes act on behalf of their communities as protectors. As such, both should have access priest spells. As suggested by their divine magic skill, the cleric can use it much easier than the paladin. Solidifying Cleric as the better healer. "The Fighter is a champion, swordsman, soldier, and brawler who lives or dies by the knowledge of weapons and tactics. Fighters can be found at the front of any battle, contesting toe-to-toe with monsters and villains. A good Fighter needs to be strong and healthy if hopes to survive." The fighter is the quintessential offensive melee class. Paladins are your bread and butter tanks. Ranger: Sleep anywhere. Retrieves 50% of used ammo from enemies. Gains a stronger Grandmaster at Arms for Archery based weapons only. "The ranger is a warrior and a woodsman who is skilled with weapons and is knowledgeable in the ways of the forest. The Ranger often protects and guides lost travelers and honest peasant-folk. A Ranger needs to be strong and wise to the ways of nature to live a full life." 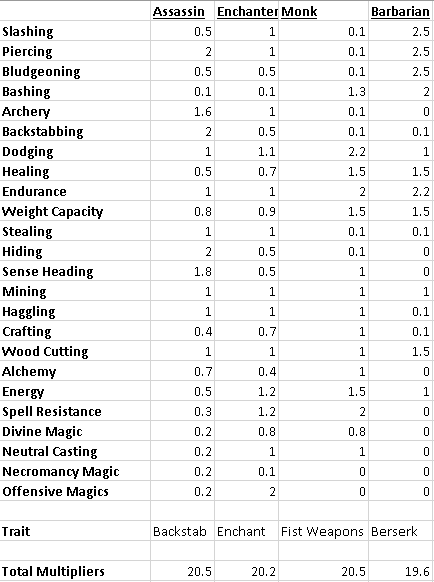 Lumberjack: Woodcutting EXP based off grade of wood obtained. Live another life, one of a civilian trying to make a living, not concerned with the worries of the world. Mechanics: Transforming restricts you to using a special weapon gained by shape shifting. Cannot cast spells while transformed. Wearbear form: Damage based off Endurance, HP from Endurance doubled. Loses ability to dodge. Attacks can bash, but cannot crit. More play styles to the Druid. Right now the way to go is pretty much always using Slashing weapons until the level is reached where 600 Dodging is attainable, and then the Slasher is used. Change Wizard group into Mage and Specialist Mages. A mage who concentrates his efforts in a single school of magic is called a specialist. Their proficiency in that school increases, but incurs a penalty to other schools of magic. Mage: Doesn't excel at any particular magic group, but is decent at the majority of them. Because a Necromancer really isn't a priest, and could probably use something to distinguish itself from a normal mage. A rogue whom specializes in murder. Backstab: Assassins excel at backstabbing, their backstabs are more damaging than their Thief counterpart. Assassin's Poison: Imbues the assassin's weapon with a damage over time proc upon hitting an enemy. Effect can only occur on the first hit. Ability can only be used every 2 minutes. Specialist: Can steal gold, but cannot steal items. Most of the time you pick a thief for stealing, not necessarily assassinating people. A fighter whom specializes in hand to hand combat. Knock-out: All hand to hand attacks have a chance to bash. Distance is limited to 5m overall, damage is the same. "Monks are warriors who pursue perfection through contemplation as well as action. They are versatile fighters, especially skilled in combat without weapons or armor. Though Monks cannot cast spells, they have a unique magic of their own: they channel a subtle energy, called ki, which allows them to perform amazing feats. The Monk's best known feat is their ability to stun an opponent with an unarmed blow." My thought here is that Dodging weapons could be considered "Hand-to-Hand" based weapons. And for TRPG, I'm thinking to only disallow offensive magics for the class. A mage who focuses on increasing the damage of himself or his allies. He loses the ability to cast any offensive spells within the elements. A "mage" whom is more melee oriented than what you'd typically expect. He would be able to cast buffs on himself and/or an ally to do damage. Extra damage from the buffs would always be "dealt by" the caster, so in a party situation, he could be a complete support class. Berserk: (Toggle) Activate to significantly increase attack speed and damage, while also increasing damage received. Also receives a movement speed bonus. Costs ? mana per second. Deactivates under 10% mana. Berserk could be a castable neutral spell with no delay, and minor recovery time with the only requirement being the Barbarian class. "Unequaled in close-quarter combat and mastery of weapons"
This class would be the ultimate melee class, focusing ONLY upon melee. Cannot use ANY magic (other than his self-buff and remort), and cannot use ANY archery weapons (Except for Sling, because it has zero requirements). Cannot use Sense heading at all, cannot Hide, and is awful at just about everything that doesn't involve combat, or displaying strength.